Awash in melon and azure hues, accented by a working fireplace and an elaborate tile mosaic on the far wall and crowned by a lovely pressed-tin ceiling painted blue, Momos resembles the fairy-tale, movie-set Mediterranean tavern of our collective subconscious. That was written in 2004 by Rose Martelli, a restaurant critic for The Riverfront Times. The entire review (delightfully titled “Grecian Yearn”) is still worth reading 7 years later. One of my favorite parts is where Rose tells us that her dessert at Momos was so good that she didn’t know whether to cuss or cry. I imagine Rose sitting at her table under the blue pressed-tin ceiling, a phyllo pastry piled with ice cream and chocolate sauce before her, and her face screwed up like a dried-apple doll while she tries to decide how best to express her extreme emotion. It must have been a wonderful dessert. The story goes that Zeus, Poseidon and Athena were arguing about who could make something truly good. Zeus made the most excellent of all animals, man, while Athena made a house for people to live in, and, when it was his turn, Poseidon made a bull. Momos (Complaint) was selected to judge the competition, for he was still living among the gods at that time. Given that Momos was inclined to dislike them all, he immediately started to criticize the bull for not having eyes under his horns to let him take aim when he gored something; he criticized man for not having been given a window into his heart so that his neighbor could see what he was planning; and he criticized the house because it had not been made with iron wheels at its base, which would have made it possible for the owners of the house to move it from place to place when they went traveling. All save Momus, god of laughter. He alone gives constant joy. Hail to Momus, happy boy. Wilcox’s poetry is often included in collections with titles like Worst American Poems of All Time. 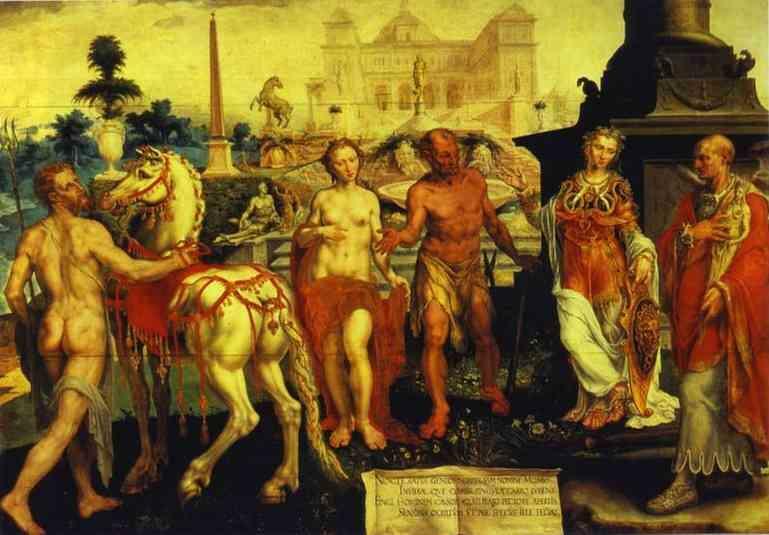 So what did she get in return for flattering Momus? Ridicule and criticism. It’s like that with writing. Sometimes it seems as if nothing I write goes the way I want it to. I told someone recently that I wished to goodness that writing were like making pound cake—find a recipe you like, master the technique (beat it to death), and you can be proud of the results. Writing is never that simple, and the results are far from predictable. I am often my own severest critic, never letting a story out to be read by anyone because I think it’s not good enough. It doesn’t have a window to its heart, or eyes below its horns so it can hit a target, or wheels so it can be moved about. But after we cuss, cry, or pitch a real fit that incorporates both activities, we must summon up our Zeus-like power and pitch this inner Momos off of Mt. Olympus. Then we can get back to our writing. Eventually it will come out right. On Saturday morning Mama and Daddy were sitting drinking coffee when Mama disturbed the peace by mentioning gutters. This was an old, old story that I had lost interest in some time back, but Mama had become fervent about the need to get the gutters cleaned so that water would not build up and drip down her neck when she walked out the back door. Daddy had no interest in cleaning gutters. He is not light on a ladder, nor is he particularly deft at height. For weeks he had put Mama off, advising caution and the need for expertise. Now Mama was fed up and wanted action. “Was it, now?” Daddy asked. I could tell by the set of his mouth that he didn’t think much of a man who was nimble on a ladder. Daddy hates to come up short in any competition. Daddy is peacock-proud of Mama’s fiery spirit, right up until the minute when he is on the receiving end of it. Then he finds it offensive, and says so. I noticed that he went out to fetch the ladder though, and he even leaned it against the side of the house. Weatherby Soames arrived in due time. He pulled up in a small red pick-up truck, and behind him came a large woman with interesting hair in a silver Mercury. Daddy met them in the yard, but once he had seen Mr. Soames safely up the ladder he ushered the woman into the kitchen to visit with Mama. Mama’s Southern hospitality and naturally excellent manners fought briefly with her desire to present Bethany with a fresh cake for her second birthday. “Would you like a piece?” she asked, somewhat unnecessarily. I saw her hand shake a tiny bit as she took the dome off the cake, but then she raised her head high and cut a good-sized piece for Mrs. Soames and smaller slices for the rest of us. Bethany was napping, so she didn’t know. Daddy was delighted. He suggested that Mama put on a pot of tea to go with the cake, and when Mrs. Soames admired the blue willow tea pot and cups he went and fetched the camera and took a picture of her drinking tea. “I’ll send you a copy to keep,” he promised. 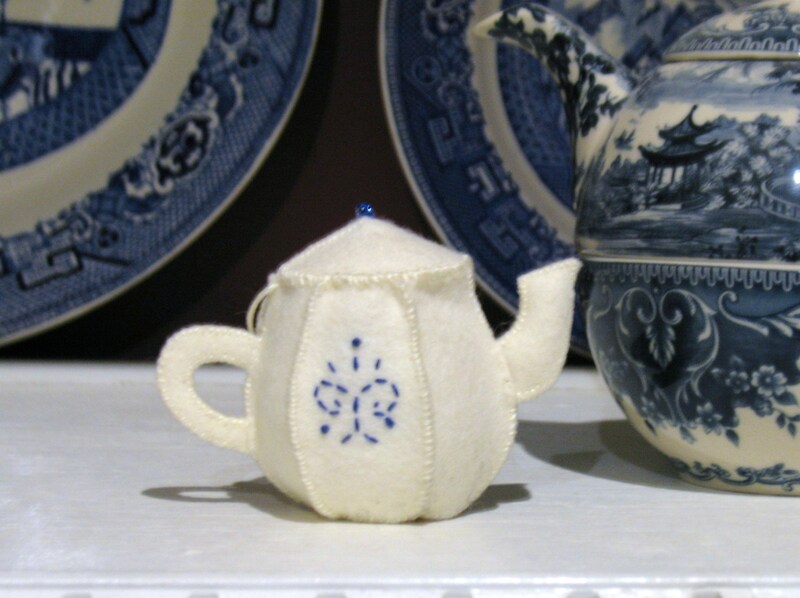 Mrs. Soames didn’t say no to a second slice of cake, and then she caught sight of Mama’s little wool felt tea pot ornament that sits on the shelf with the blue willow tea things. She got up from her chair to look closely at it, and went wild over it—pretty much exactly the way Mama had fussed over it when she first got it. Mama explained that her childhood friend had made it for her and sent it at Christmas time for a tree ornament, but Mama loved it so that she wanted to keep it out all the time. Mr. Weatherby Soames appeared at the back door, looking in, and Mrs. Soames made him come in and have his share of the cake and tea. Daddy paid Mr. Soames, and to his disappointment Mrs. Soames almost immediately set down her tea cup and announced that they must go. “Good grief,” Mama said, after the door had closed behind them, “I thought we were probably going to have her here all day, or at least until after dinner.” She stopped and stared at her shelf with the blue willow cups and saucers on it. I told Mama that when Mrs. Soames walked past me on her way out the door I saw that she had the little wool felt tea pot in her dress pocket. I wished I had the nerve to say something before it walked out, because I knew that Mama thought a lot of that little tea pot. “You did the right thing, Dixie,” she told me. “I wouldn’t want you to embarrass a guest.” But she sighed when she said it. He was deeply content. Mama was wistful. “What’s that?” Mama asked. Wearily, she began to collect the dirty cups and plates and put them in the sink. ''Eine Kleine Schnee-Musik'' (''A Little Snow Music''), ca. 1962, box construction by Joseph Cornell. My brother, Hank, showed up at lunchtime so I took him down the block for oysters and chicken wings. Hank had been out of work for about six weeks. I was trying to be patient and kind—an uphill battle. Part of me suspected his main problem was that he was 23, beer-sodden, and a bit lazy. But I also knew that Hank was smart if not overly ambitious. I resolved to be positive and supportive and everything. Hank turned away as if embarrassed by my lack of sisterly feeling. He looked scruffy—poorly shaven, in need of some more robust personal grooming. A clean shirt. He’d look really nice if he made more of an effort. I have tons of friends who would love to date him. Well, they would if he had a car. He raised an eyebrow at that, but said he’d developed a preference for Clanahan’s couch. He thanked me for the offer, though, before walking with me to an ATM and then heading off on his bike to catch a ferry back to the mainland. I watched him pedal off, his blond hair glinting in the sun. A golden boy—a pool boy—who needed a haircut. Whenever my finances took a hit and I felt poor and depressed, I got an inexplicable itch to go shopping and buy something. This had been happening a lot lately. I drove to the mainland the long way around, by the bridge, and felt better the minute I parked in front of SteinMart. SteinMart was one of my happy places, where the price tag revealed how much money I was saving. I loved that. But today when I went through the automatic doors it only took about 30 seconds for me to feel a strange discomfort. It hit me as I strode down the aisle that normally took me past the cocktail dresses. As I walked further into the store, I thought perhaps I was experiencing an allergic reaction to the oysters I’d eaten at lunch. Then I realized the true cause of my unease: SteinMart had been disconcertingly rearranged. I stopped walking. An older woman several yards to my left (where the sweaters should have been but weren’t) caught my eye. Her hand rose, then fell to her side. “I don’t know where anything is anymore!” She flung the words across the aisle. Her words stung with the bitter salt of profound truth. I didn’t even know where Clanahan lived, or how to get in touch with my own brother in an emergency. Defeated, I lost the urge to shop and went home without the satisfaction of buying anything. I had trouble falling asleep that night, and around two o’clock in the morning I was awakened by blue flashing lights on my ceiling and some sort of commotion in the front yard. I pulled a sweatshirt over my t-shirt and pajama pants and tentatively opened the front door to see what the fuss was about. “I thought he was one of your friends!” the woman on the porch called out. I looked over at my side yard and saw two police officers standing over a guy sitting on the grass with his arms crossed on his knees and his blond head on his arms. I hurried toward them. “Is this your boyfriend?” one of the officers asked. “No! He’s my brother.” I knelt next to him. Hank didn’t lift his head, he simply sat there quietly, obviously confused and distraught. I put my arm across his shoulders, awkwardly, and talked to him. I tried really hard to be soothing and loving and sweet. Finally, his utter sadness soaked into me, and I started to cry. The policemen waited patiently as I cried and told Hank that everything would be fine—he’d get a real job soon, and in the meantime he’d be making enough money to get by and Mom and Dad would have loved the fact that he was going to be a pool boy—how they would have laughed! And it was only a temporary thing and soon we would feel less pain over them being gone and we’d be able to share all the memories of the good times. The only good thing left, I said, squeezing his shoulder, the one thing that I held onto was that we still had each other. It was all we needed, now. It was all there was, because goodness knows there was nothing we could smoke or drink or buy that would make things better. I put my hand under his chin and lifted his head up so I could tell him, face to face, that I could help him stay oriented, too. I looked deep into his eyes. “Oh, crap, you’re not my brother!” I said. The minute I said it, the cops flipped the guy over, handcuffed him, and stuffed him into the waiting patrol car. I stood up and brushed off the seat of my pajama pants. Doug was doubled over, he was laughing so hard at the collapse of the high drama. I used my sweatshirt sleeve to scrub off the tears. Maybe it would seem funny tomorrow. Once I found him, I could tell Hank about it, and he would hoot. Author’s note: Any ideas for a title would be gratefully received. I couldn’t come up with one to save my life. Also, I apologize for the illustration being so completely unrelated to the story, but I am reading a lot about Joseph Cornell right now, I love his shadow boxes, and guess what? Our forecast calls for snow tomorrow night! So it all makes sense. In a way.